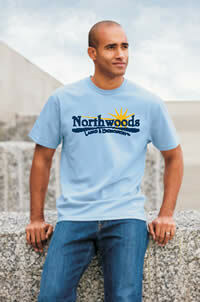 Located in Germantown, Wisconsin, Northwoods Laser & Embroidery LLC offers custom laser engraving, sublimation, embroidery, and screen printing services. Using state-of-the-art technology, we are building a reputation for our quality products and services at reasonable prices. We can personalize a wide variety of awards, plaques, name badges, signs and gifts using our laser and sublimation technologies. We can provide unique items for that special occasion – graduation, anniversaries, birthdays, weddings and holidays. Browse our suppliers’ catalogs within our website and choose items to uniquely personalize with your own logo, text or photographs. We will also engrave items supplied by you. Using embroidery, sublimation, or screen printing, our apparel decorating services can help you portray the image that you want. You can give your group, team or crew a distinctive look. Browse our apparel catalogs for sports shirts, dress shirts, t-shirts, sweatshirts, athletic wear, totes, blankets, eco-friendly products, and much more to meet your image needs. Please browse through our website and call or e-mail if you have any questions or would like a quote.